If you had told me — even as I was writing it — there would be a signing party centered around the release of I Can’t Be the Only One Hearing This, I would have questioned your sanity. I still might. But we now live in a world where that very thing has happened. I now fully understand what musicians mean when they say they’re thrilled to break even after a tour. I don’t think people fully grasp the expense non-mainstream artists must undertake just to bring their work to the public. I knew, but never truly had to live it until now. In order to host a book signing, I needed books. My publisher is the literary equivalent of an indie record label. They’re a great help, but they can only do so much. If I wanted a box full of books, I had to buy them. So that’s what I did. I went to Planet Score Records with a box of books purchased on my dime. I believe in my book. It was time to prove it. I went to the store with a box full of books and came home with three. And I sold two of those remaining three books at work the following day! In the end, I recovered my initial investment, plus a few bucks extra. I won’t be able to retire, but I didn’t flush my money away, either. I’m calling that a win. This also goes to the heart of why I haven’t kept track of the exact number of books I’ve sold. I know they’re out there, and I know people have bought them. That’s really all that matters. The instant I start counting sales, I start making those numbers equivalent to the book’s worth. BIG MISTAKE! My publisher reminds me all the time that book sales are a marathon, not a sprint. It takes YEARS to get known in the literary world. I have two months. So don’t ask me for numbers, because I don’t (and won’t) have them. This is also why I’m not upset when some of my co-workers show no interest in buying my book, or coming to its release party. I don’t want anyone buying my book because they somehow feel obligated to do so. You. Are. NOT. Besides, my professional and musical worlds are, for the most part, completely separate entities. I like it that way! If you’d like to buy a book, wonderful! I appreciate it, and I’ll be happy to ensure you get one. But please do so because you want to! Chris Mead, whom I haven’t seen since high school! What really blew my mind was a man named Russ Kingsbury, who drove 200 miles to attend my signing! 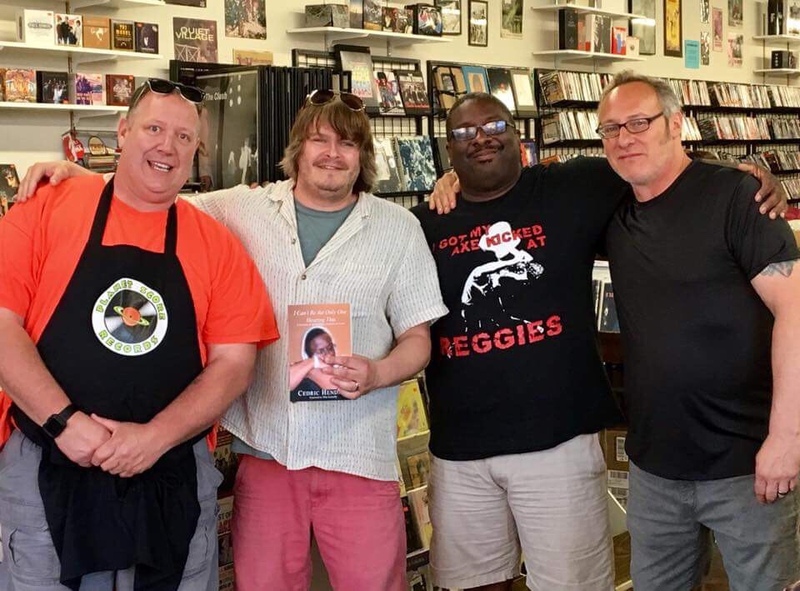 Now I’ve done my fair share of traveling for concerts (as this page will tell you), but it never occurred to me that someone would drive for three or four hours one way to buy a book and meet its author, particularly when the author in question is ME! Thanks, Russ. I’ll never truly have the words for what your trip meant to me. Russ Kingsbury, a true fan. Speaking of gratitude, I must thank my friends Tory Z Starbuck and Billy Barnett for lending their musical talents to the proceedings. I don’t get to see my old friends very often these days, and it was a real blast from the past getting to see/hear them again. If I had been thinking, I would’ve gotten a picture of the three of us together. But I wasn’t thinking. That’s on me. Most of all, I must thank Joe Stulce and Tim Lohman for pretty much turning Planet Score Records over to me for three hours on a Saturday afternoon. They didn’t have to do that, and they certainly could have restricted my movements and activities in the store. But they were nothing but gracious the entire afternoon as they tended to the needs (spoken and unspoken) of a nervous first-time author. I do the overwhelming majority of my record shopping in that store for a reason. You should, too! Will I be doing another signing? I don’t know. Not for a while. And probably not in St Louis. I probably could’ve advertised the event a little better. Social media is effective, but it’s not the be-all, end-all of promotion. For the next event, I’ll be sure to use more media outlets. Which, in turn, will probably call for me to bring more books. I hope. The dream is to have a signing in Chicago, which is rapidly becoming my second home. But that’s down the road a bit. I’d be wrong if I didn’t thank Susan Claridge and Global Publishing Group for making this little adventure possible. I really appreciate it, and I’m hoping the fun has only begun. You can find my book on Amazon, Barnes and Noble, and wherever fine books are sold. Previous My Favorite Concert: Pretty Much ALL of Them! Very nice, C. That’s pretty exciting to be a published author and have a signing. For the record, I also have a book coming out (in the fall) but it is zero music-related and is totally business-oriented. I enjoyed writing it but the odds of there being a signing or even selling more than a handful of copies is pretty negligible. It’s a marketing tool that – like your book- one hopes gets to the right people. Anyway, congratulations. That’s the coolest thing I’ve heard all day.